GUY FAWKES DAY history begins with the events of November 5, 1605, in which Guy Fawkes — a member of the “Gunpowder Plot” — was arrested while guarding explosives he and his co-conspirators had placed beneath the House of Lords. Celebrating the fact that King James I had survived an attempt on his life, people lit bonfires. 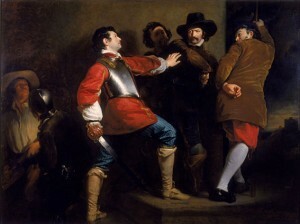 Months later, the introduction of the Observance of 5th November Act enforced an annual public day of thanksgiving for the plot’s failure. It was proposed by a Puritan Member of Parliament, Edward Montagu, who suggested that the king’s apparent deliverance by divine intervention deserved some official recognition and made November 5 a free a day of thanksgiving. Thus, making attendance at church mandatory. Unfortunately for Guy, he was scheduled for execution on January 31, 1606, but died as a result of a fall received when trying to escape. In Britain, November 5 is called Guy Fawkes Day. Bonfires were accompanied by fireworks from the 1650s onwards and it became the custom to burn an effigy. Effigies of other notable figures who have become targets for the public’s ire, such as Margaret Thatcher, have also found their way onto the bonfires, although most modern effigies are of Fawkes. You have undoubtedly seen lurking Guy around lately. 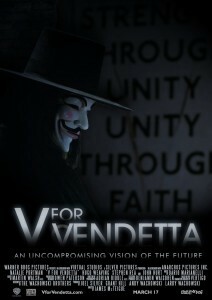 Guy’s image has been recently appropriated as the villain in the 2005 movie, V for Vendetta, and by the computer hacking organization known as “Anonymous.” As a result of all the publicity, the mask has become a top-seller on Amazon.com. The rights to the mask image belong to Time-Warner, who collects a fee for every mask sold. Who says “crime doesn’t pay”? Originally published at Jeff Macharyas.